The rising cryptocurrency boom has sparked a fundraising scheme called initial coin offerings that have become a money-pumping machine for startups but also have a problematic reputation. 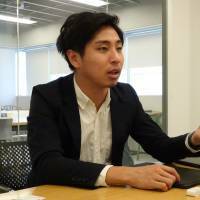 Masahiro Yasu, 29, chief executive officer of Tokyo-based startup Alis Co., experienced the power of the ICO when his firm raised ¥100 million in virtual currencies in just four minutes last March. “We were confident of our business plan . 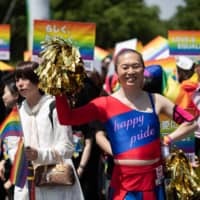 . . but we were surprised when we could actually attract that much money that quickly,” Yasu said in an interview last month, adding that his firm successfully raised its goal of over ¥400 million in about 10 days. Globally, startups looking to launch businesses using the blockchain, the underlying technology of cryptocurrencies, have veered into ICOs and raised billions of dollars in the past year. Yet in Japan, Yasu is apparently a rare breed. Japan may be one of the hottest cryptocurrency markets in the world in terms of trading volume, but it has yet to fully embrace the ICO trend. The Financial Services Agency has not set clear rules and is taking a careful stance out of concern for fraud. Experts and industry players agree the ICO is still premature as a fundraising method, as investors could be easily duped. But they also said it will likely catch on in Japan, saying the key is having a legal framework to balance the merit of ICOs with consumer protection. 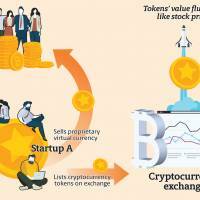 ICOs have become more visible in the past two years and are closely related to the cryptocurrency boom because the process is basically an exchange of virtual currencies between companies and investors. 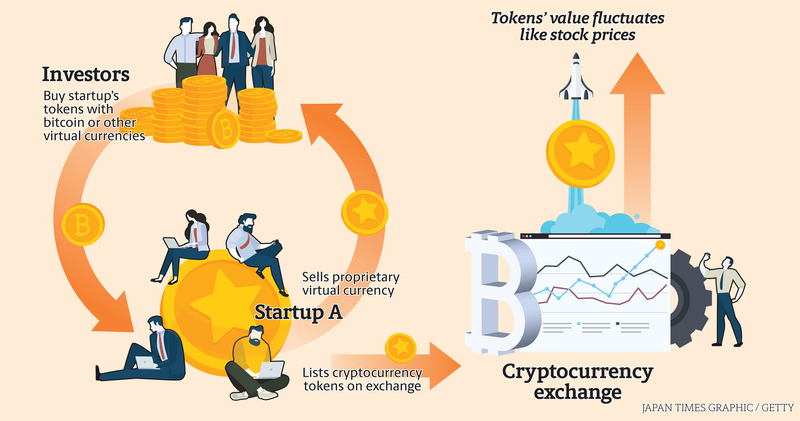 Startups issue proprietary digital tokens and sell them to investors, who pay using mainstream cryptocurrencies, such as bitcoin or ether, the second-most popular virtual currency. The concept is similar to stocks, as the proprietary tokens are expected to be listed on virtual currency exchanges and traded. If startups do well, the value of their tokens goes up and benefits investors. ICOs have grown bigger these days, especially among those seeing business opportunities from the blockchain technology. The blockchain works on a peer-to-peer network that links people’s computers directly without the use of a central server and records each transaction from the beginning. The data can be mutually and simultaneously monitored by individuals called “miners,” which makes falsification effectively impossible. The technology is often seen as an innovation due to its immunity from data falsification and traceability and is used as the backbone system for cryptocurrencies. Many believe it can be applied to other record-keeping tasks as well, including those for industrial quality tests and government management of citizens’ data. Various companies are trumpeting new blockchain businesses to raise money through ICOs, which give them chances to acquire vast sums without convincing venture capitalists, relying on bank loans or conducting initial public offerings. CoinSchedule, which runs a website about ICOs, said 2017 saw $3.8 billion worth of virtual currencies procured through the new fundraising technique, a significant boost from $95.1 million in 2016. But there have only been a handful of ICOs in Japan, according to the FSA, the nation’s financial watchdog. Notable cases include Quoine Pte., a Tokyo-based cryptocurrency exchange that raised about ¥12.4 billion in November — a record among Japanese companies, according to a report by the daily Nikkei. Yasu’s Alis is one of the few ICO examples in Japan. The firm aims to release a social networking service that is focused on providing news articles on a blockchain-based system. Users will be motivated to write and promote high-quality articles in return for digital tokens issued by Alis, said Yasu, who used to work at Recruit Co. In its ICO, the firm raised ¥400 million from over 4,000 investors and listed its Alis token on cryptocurrency exchanges abroad. 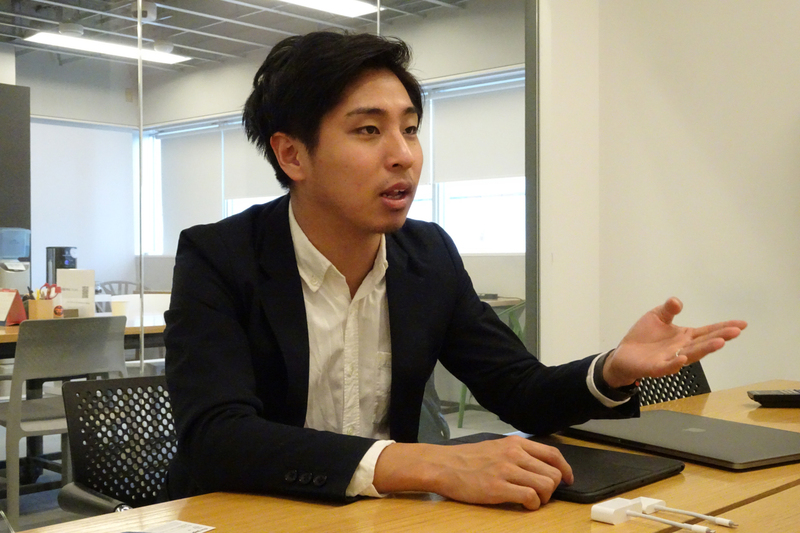 “It’s more like a new way of business development involving users and investors” who strongly agree with the startups’ business ideas, Yasu said. Yet at the same time, Yasu and cryptocurrency observers warn there are many potentially fraudulent cases hampering healthy ICO growth. Unlike making initial public offerings or receiving venture capital money, ICOs have no due diligence conducted by outside parties to check the credibility of companies. Investors have to rely pretty much all on business blueprints called white papers issued by the companies themselves that describe their business plans. “The white paper is the only (way to check the company) but it just talks about how it wants to develop the business in the future, so people can be easily tricked,” said Pina Hirano, who heads the Blockchain Collaborative Consortium, a Tokyo-based organization that promotes the use of blockchain. In many cases, firms have not launched a product yet. Also, the blockchain technology is not easily understood by general investors, Hirano said. Parties with malicious intent might advertise that investors can definitely make money and then refuse to issue tokens, said Hirano. In November, the startup Confido, which apparently aimed to develop a new payment solution, disappeared after raising $375,000, overseas media reports said. The caution surrounding ICOs is growing. In January, Facebook said it would ban all cryptocurrency-related ads, including those for ICOs, from its social media platforms, including Instagram. Google announced earlier this month it would ban such ads starting in June. The U.S. Securities and Exchange Commission included cryptocurrencies and ICOs in its 2018 examination priorities document released last month. Some countries, including France, plan to come up with regulations to let ICOs arrive within a legal framework, while others including China, have imposed a ban. As for Japan, there are no clear regulations for ICOs at this point. The FSA released a statement last October saying that ICOs may fall into the scope of current regulations, although each case needs to be reviewed. An official at the FSA, who spoke on condition of anonymity, said one major point is how the tokens issued by startups will be used. If they are to be used as payment among unspecified individuals, they would be identified as cryptocurrencies. In that case, Japanese cryptocurrency exchanges would only be able to trade virtual currencies approved by the government. Also, if investors are to receive rewards like dividends through the proprietary tokens, they could be regarded as collective investment schemes or investment funds. Those that engage in such financial businesses are legally required to have a government license to operate. Some experts said companies can technically launch ICOs by listing their tokens on overseas exchanges, which was the case with Alis. Yasu said he consulted the FSA first. But the Alis ICO was launched before October, when the FSA issued its warning, and the scene has changed significantly since cryptocurrency exchange Coincheck Inc. was hacked in January and lost ¥58 billion worth of NEM coins. So now is apparently not a good time to launch ICOs and it is difficult to do so without drawing attention from the FSA. Yet the FSA is aware ICOs have merit, too. “While we warn that there is potential for fraud with ICOs, they make it easier for startups to raise money,” the FSA official said. “We need to balance the merits of ICOs and consumer protection,” he said. Hirano agreed saying that the key for regulators is how to eliminate bad ICOs. The FSA formed a research panel on cryptocurrencies this month that is likely to discuss ICO regulations in the coming months, the official said. 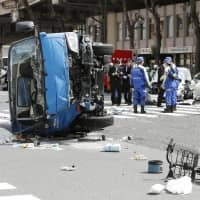 While the careful approach may be necessary, some Japanese firms are confused about the situation. Takaro Harada, who heads Mtes Co., a Tokyo-based energy management firm, was looking to raise money through an ICO, but the situation has changed. 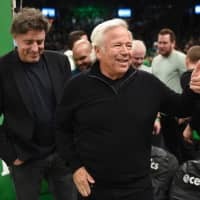 “(The Coincheck hacking) had a big impact. We were originally aiming for an IPO and have received capital from established Japanese firms. In that sense, it’s not a good idea to do an ICO when society’s mood for the cryptocurrency is negative,” Harada said. Mtes is now thinking of how it can somehow launch an ICO under the advisement of the FSA, he said. Seeing business opportunities from an anticipated boom in the internet of things, Mtes wants to mass produce sensor devices that can monitor the conditions of building structures, roads and other infrastructure. To do that, “while preparing for an IPO, we need to raise capital in a timely manner through a fundraising method” other firms use globally, namely an ICO, Harada said.